Whether your focus is a specific art and design studio or an inter-disciplinary practice, experiment, collaborate, play and take risks through the Bachelor of Fine Arts. Marina Abramovic, James Turrell, Bruno Latour, Alfredo Jarr, Kirsha Kaechele and Patricia Piccinini. These are no ordinary artists, curators and theorists. 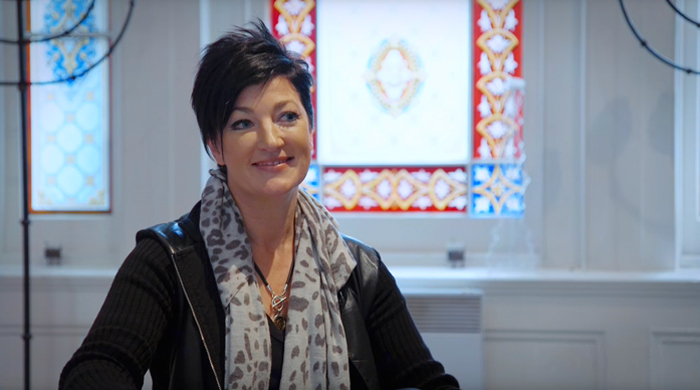 But as a Bachelor of Fine Arts student, you can expect regular opportunities to engage and work with acclaimed international artists of this calibre commissioned by local institutions such as MONA, the Tasmanian Museum & Art Gallery, QVMAG, Detached and Contemporary Art Tasmania. Participate in iconic festivals such as Dark Mofo, Ten Days on the Island, and Junction Arts Festival. Engage with acclaimed artists commissioned by MONA, TMAG, QVMAG, and more, through our visiting artist programs. Practice in generous and creative spaces that fuel your imagination. Our campuses, located in the heart of each city’s cultural precinct, occupy Hobart’s former IXL Jam Factory and Launceston’s historic Western Railway Yard. Delivered by the School of Creative Arts, we will connect you with visiting artists and designers through our partnerships with acclaimed events such as Dark Mofo, Ten Days on the Island, Junction Arts Festival and The Unconformity, through Artist in Residence and Arts Forum programs. This degree also provides global creative and cultural context, with industry, community and research opportunities available in Tasmania, interstate and overseas. Be a part of Tasmania’s intimate and internationally recognised creative community. Build a closer relationship with staff, students, and industry through diverse real world projects and quality exhibition programs. Spend more time realising your creative potential studying art in Australia’s most affordable university city*. 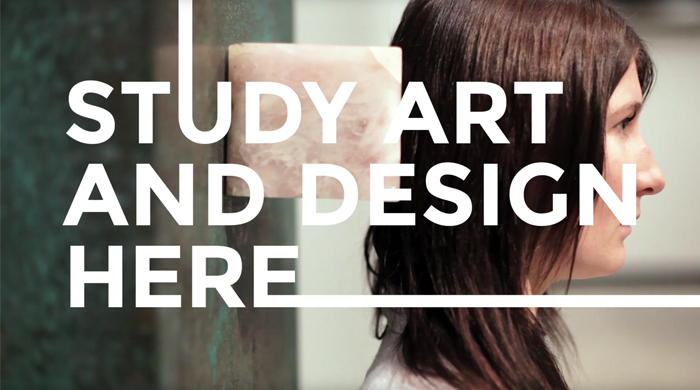 Interested in studying art and design? Take a look at just a few highlights of our Current Students Work (PDF 3.27MB) from 2016. * Student Cities Australia, 2016. 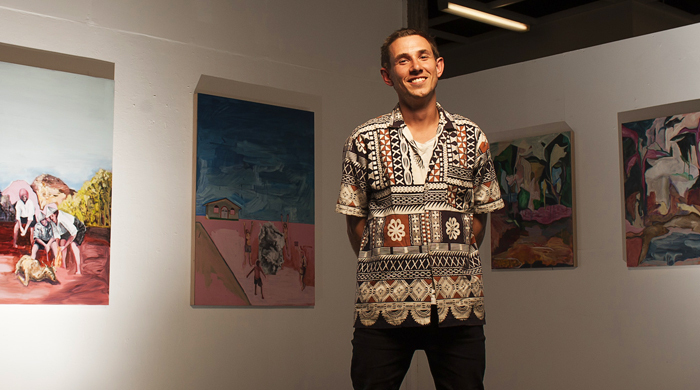 From engaging with acclaimed international artists to participating in Tasmania's thriving and experimental art scene, visual artists Micheila Petersfield and Sam Field tell us what they loved about the Bachelor of Fine Arts experience at UTAS. Define and articulate, to relevant audiences, a broad and coherent theoretical and technical knowledge about the diverse contexts (e.g. social, cultural and historical) that inform all aspects of art practice. Synthesising formal, technical and conceptual knowledge via interpretation and adaption. Exercise well-developed initiative and judgement in developing cognitive and technical skills, to manage contingencies with some independence, provide solutions to sometimes complex problems and deliver conceptually multi-layered, resolved art works. Undertake self-directed, speculative inquiry in one or more disciplines to develop new, individual creative practice artefacts by adapting well-developed knowledge and skills in diverse contexts, and executing projects with unforeseen outcomes. Develop a self-defined creative practice and/or inquiry that is autonomous and demonstrates knowledge of professional, scholarly, and/or social communities. An award-winning London-based furniture designer. The friends who founded their own brand agency in Melbourne. A contemporary artist whose dreamy installations have taken New York City by storm. These are just a few examples where a Fine Arts degree has taken our graduates. Studio major equating to 8 units: 2 introductory (25cp), 2 intermediate (25cp) and 4 advanced (50cp) units. Degree Core Knowledge (Critical Practices) equating to 8 units: 2 introductory (50cp), 2 intermediate (25cp), and 2 advanced units (25cp). Discipline Electives: 2 intermediate (25cp) units. Breadth Units: 2 units at any level (25cp). Experience & Engagement equating to 4 units: 2 introductory, and 2 intermediate or advanced (25cp) units. Student electives are your choice of units from any study area across the University, subject to meeting relevant prerequisites and quotas. You may choose to enrol in additional Fine Art units or a study area from another degree (eg, French, Gender Studies). To explore the vast array of study areas from other degrees go to www.utas.edu.au/courses/search-units and use the selection criteria to obtain more specific data (for example introductory level, semester 1, Hobart, study area: French). If you need further assistance please contact Arts Student Central, Tel: 61 3 6226 7814 or email Arts.Faculty@utas.edu.au. Experience and Engagement electives are your choice of units from any study area across the University, subject to meeting relevant prerequisites and quotas. You may choose to enrol in additional Fine Art units or a study area from another degree (eg, French, Gender Studies). To explore the vast array of study areas from other degrees go to www.utas.edu.au/courses/search-units and use the selection criteria to obtain more specific data (for example introductory level, semester 1, Hobart, study area: French). If you need further assistance please contact Arts Student Central, Tel: 61 3 6226 7814 or email Arts.Faculty@utas.edu.au. Advanced level: 0 minimum to 2 maximum. View all details for FFX214 What are the Limits? View all details for FFX314 What are the Limits? Pre-tertiary TCE subjects in creative arts or design are desirable, but not essential. In some instances, you may be requested to submit a portfolio of artwork (for example reproductions, photographs or video) to support your application. Before preparing your portfolio, talk to us on 1300 363 864 or enquire online about your eligibility. 2019 Total Course Fee (international students): $94,585 AUD*.